Aksel Rykkvin is a Norwegian treble of astonishing talent, combining a rare musicality with a beautifully resonant voice. 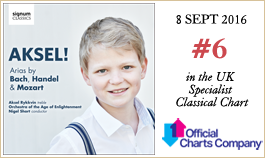 For his exuberant debut recording—featuring works by Mozart, Handel and JS Bach—he is accompanied by the Orchestra of the Age of Enlightenment under Nigel Short. It is the fundamentally ephemeral nature of music that fascinates. Much of the paradoxical delight of historically informed performance practice lies in the fact that we can never re-capture original performances of Bach or Handel; yet striving to understand what time has taken away from us brings the music more and more alive. Written scores are the magic door into another world. Similarly, the boy soprano voice holds a unique enchantment, not least because it is such a transient phenomenon. So does the child prodigy; and nobody embodies all three more than the young Mozart. By the time he was 16 years old, Mozart had three mature operas to his name, and had performed across Europe. He was nearing the end of his Italian journeys and about to enter the employ of the Salzburg Archbishop’s court when he wrote Exsultate, iubilate (K165). Though there is nothing overtly childish about the cantata, you can hear the pleasure that Mozart took in the ebullient South German style he had picked up in the course of his travels. We know that the cantata was written for Venunzio Rauzzini, who had himself been a boy soprano in the Sistine Chapel, where two years earlier Mozart had illegally downloaded Allegri’s Miserere to his own brain (and hand-printed it, later, onto paper). Rauzzini performed the title role of Mozart’s Lucia Silla, and after hearing the premiere in Milan, the teenaged composer was inspired to write Exsultate, iubilate for him. We can never know how Rauzzini’s voice would have sounded, but a mature treble can convey some of the ethereal magic that a castrato must have had. At the age of 12, Aksel Rykkvin has no trouble recapturing both the young Mozart’s enthusiasm and the older Rauzzini’s technical accomplishment. Fifty years earlier, Johann Sebastian Bach was settling into his job as Cantor of St Thomas’s Church in Leipzig, which entailed composing for services, teaching music, arranging the church’s musical life, and raising his numerous children. That was obviously not enough, because he accepted a commission from the students of the university to write a cantata for the name day of their much-loved law professor, August Friedrich Müller. The short secular cantata Der zufriedengestellte Aeolus, to a libretto by Christian Friedrich Henrici, hinges on the quirkily anachronistic premise that the goddess Pallas Athene needs to dissuade the storm god Aeolus from ruining Professor Müller’s festivities. She enlists the aid of Zephyrus. Bach must have liked the aria, since he recycled it four years later for a sacred cantata. In 1725, Bach also found the time to keep a musical note-book together with his young second wife, Anna Magdalena, herself an accomplished singer. Bist du bei mir has its own BWV number (508), but in fact the tune was composed seven years earlier by Gottfried Heinrich Stölzel as part of his opera Diomedes, oder die triumphierende Unschuld, and Anna Magdalena might well have written a new accompaniment for the note-book. A decade later, on the other side of the English Channel, Bach’s compatriot Handel was penning what would become a major hit for Covent Garden (Alcina, 1735). Just as Mozart was inspired by Rauzzini, Handel was moved by the talents of boy soprano William Savage to include him as the young Oberto in his opera, penning three different arias to show the youngster’s emotional range and virtuosity. Aksel, a veteran of the opera stage, clearly relishes the drama of Barbara! io ben lo so. The sorceress Alcina is about to kill Oberto’s father, whom she has turned into a lion; furious, Oberto stops her. In Chi m’insegna il caro padre, William Savage had the chance to display his talent for pathos and melancholy as his character, Oberto, searches in vain for his missing father. It was not only musical skill that brought Handel to the point of penning popular operas for Covent Garden. He was also an assiduous networker, with considerable charisma and a talent for using it with the right people. One of those was Dr Arbuthnot, the private physician of Queen Anne. That gave him the access he needed to write the Ode for the Birthday of Queen Anne in 1713. Since it was his first compositional venture with the English language, he took Henry Purcell as his guide, penning a somewhat old-fashioned combination of brilliant solo arias with trumpet and celebratory choruses. The opening aria, Eternal source of light divine, sets the tone by inviting the sun to warm the Queen’s birthday. It worked. Queen Anne, who was normally not interested in music, rewarded Handel with a generous annual pension of 200 pounds. Twelve years after Alcina, Handel had amassed a great deal of experience with the difficulties of funding opera. His solution was to develop the genre of oratorio, which proved not only far cheaper but also a great hit with the London public. Ever the pragmatist, Handel tapped into the spirit of the time by taking themes that were both militaristic and religious; Joshua deals with the destruction of Jericho. It was Handel’s fourth oratorio in as many months, and he was less than thrilled with the libretto. He kept it short, and cut and paste a number of earlier hits into the score. Even so, it proved a triumph. Aksel sings two jubilant arias—Happy, Oh thrice happy we, in which Achsah, Daughter of Caleb, praises God for keeping her betrothed safe in battle; and Oh! had I Jubal’s lyre, where she reaches for even greater superlatives. Joshua came five years after Handel’s Messiah, which had been only a modest success at its first airing in Dublin. Though the soprano solo parts were performed by women in 1742, it is probable that Handel used boys in subsequent performances; How beautiful are the feet of Him, sweet and direct, seems ideally suited to the treble voice. Both Bach’s St John’s Passion (1724) and his Jauchzet Gott in allen Landen (ca.1730) take us to the heart of the conundrum faced by today’s interpreters of Bach’s music. Bach definitely wrote these arias for boy sopranos, but very few boys today can cope with the demands of the writing. On the whole, this is a good thing; better nutrition and living conditions mean that children today reach puberty far younger than they did in Bach’s time, when boys would often continue singing treble until they were 16 or 17 years old. It is very rare today for a younger treble to achieve the technical assurance and musical maturity that Bach demanded from his teenaged soloists. Aksel is one of the rare exceptions, with abilities far beyond his years. Lascia ch’io pianga, by contrast, was unquestionably composed for a woman. Handel first wrote the aria for his 1705 opera Almira, recycling it two years later for his opera Il triumph del tempo e del disinganno, again in London in 1711 for Rinaldo, and yet again in 1739 for Giove in Argo. Its deceptive simplicity masks a combination of desperation and seductive appeal, and the notion of handing it to a treble to perform brings additional layers of ambiguity. Aksel tackles them with ingenuous sweetness. Handel wrote Samson immediately after The Messiah, and it proved the most successful oratorio of his lifetime. It is less certain, but still likely, that Let the bright seraphim was also conceived for a female voice; as with his Ode for Queen Anne, Handel used a celebratory solo trumpet to echo the voice. Once again, Aksel finds a vocal timbre that balances the sound of the natural trumpet so well that he makes his own argument for his interpretation. Bach’s cantata Also Gott hat die Welt so geliebt (BWV68), also penned in the busy year of 1725, uses different solo instruments to entwine the joyous solo aria Mein gläubiges Herze, most strikingly the seldom-heard piccolo cello. 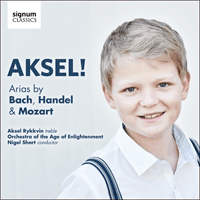 Here, the influence of Aksel’s musical approach on the musicians of the Orchestra of the Age of Enlightenment is clearly audible, as indeed it is throughout this recording; far more than being an accompaniment, the instrumental performances are a dialogue, picking up on the young soloist’s tone colour, nuance and phrasing to create a musical exchange of the most sophisticated nature. No repertoire on this recording is as rich in paradox as Cherubino’s two arias from Mozart’s Marriage of Figaro. Cherubino is an adolescent boy, bursting with hormonal energy, enthusiastically passionate about all the women in his life. The role is always played by a woman, with layers of gender confusion rising as Cherubino is disguised as a girl in the middle of the opera. Thus Aksel plays a woman who plays a man who at one point plays a woman; whether he is adding to or stripping from layers of complexity in doing so is open for debate. It is a take on the role that is at once guileless and provocative. Quia respexit from Bach’s 1723 Magnificat and Thou art gone up on high from The Messiah complete this compilation with two of the most poignant and touching melodic lines of the high baroque era. The journey leading to this album started when I was nine years old. Listening to famous soaring trebles, I hoped that some day I would record songs to give the listeners the same uplifting experience that I felt. On this journey, I have so many people to thank. My loving family, first of all. And I have two exceptionally skilful and inspiring voice coaches in Marianne Willumsen Lewis and Helene Haarr! Marianne, together with producer Sean Lewis, with his immaculate ear for details and invaluable musical guidance, are the two special people that made this album possible. What a job we did! Heartfelt thanks also to my generous sponsors and crowdfunding backers. I really hope you will listen to this album and think that it was worth it!